I often wonder if I would be a better man had I had my father in my life. Would I be more evenly keeled emotionally and spiritually? Would I be able to hug my grandfather when I see him in the hospital? No matter what substitute a mother can come up with, no matter how many aunts and uncles and stepfathers… There’s really no equal to the love and admiration a son wants to have for his father. The man you share DNA with, the man that helped create you regardless of the situation. You know what terrifies me? As much as I try to be the exact opposite of him, I see so much of him in myself. How do you rectify that? How do I fight what’s in my blood, what’s in my genetic makeup? How do I stop drinking or stop pushing people away when they get too close? Do you know how many hearts I probably broke in 2012? How many women were disappointed because I wasn’t there enough or didn’t call back after a date? What if I have a son and I’m like him? What if I become what I hate? You know how many nights I sit up at night and think about that? How many women I’ve discarded because I felt like their lives would be better with men that could give them their all. I’d never kill myself, I love life too much. But there are moments when I go way to hard for way too long knowing that I might not make it. I’m smiling as I think about those moments because who else was it but God that saved me from myself? In the barbershop the other day my brother told me that my father wanted my phone number. He didn’t give it to him because he knows me, he knows that I’m not a very forgiving person, I’m sort of heartless at times. Other men our age were listening to our conversation talking about how they forgave their fathers for not being there. They talked about being the bigger man and forgiving them because maybe our fathers didn’t know how to be men. 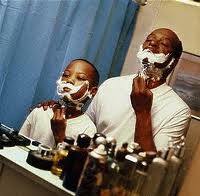 How to raise sons… I listened to them, to the sincerity in their voices and you know what I thought? I thought they were weak for forgiving. I thought our fathers don’t deserve redemption. And as I sit here alone and on the verge of being drunk for the night… Maybe I’m the one that they should pity. Because a man that can’t forgive is a man that will never be capable of loving.